My ancestry on my father’s side can be traced back to England when Michael Harrison immigrated from there to Canada a very long time ago. Since then, there have been many generations of Harrisons, and I am certain I can attribute my love of British humour and meat pies to this side of my heritage. My mother’s side originates from West Indian roots. I proudly attribute my love of intensely spicy food and rum – among many other things – to my Caribbean heritage. You will find me cheering for Grenada equally as loudly and as enthusiastically as I do Canada, for instance. I love how unique I am, and that can’t be understated. I don’t know anyone in the entire world -my sister excepted, obviously – that has the exact same heritage that I do. It’s great. In fact, I’m going to be blunt and declare that this sort of fusion works. I am proud of my mixed heritage and that’s an end of it. I’m not interested in what America 2016 has to say or what the KKK has to say. If it wasn’t for the bravery of my father who placed love ahead of what society deemed to be correct at the time, I would not be alive today. I am immensely proud of my father for taking such a stand. In that sense, I can sort of relate to the all-new 2017 Infiniti QX30. Luckily it is spared the judgemental stares and comments that I have endured growing up as a bi-racial Canadian, but it does share a similar trait. 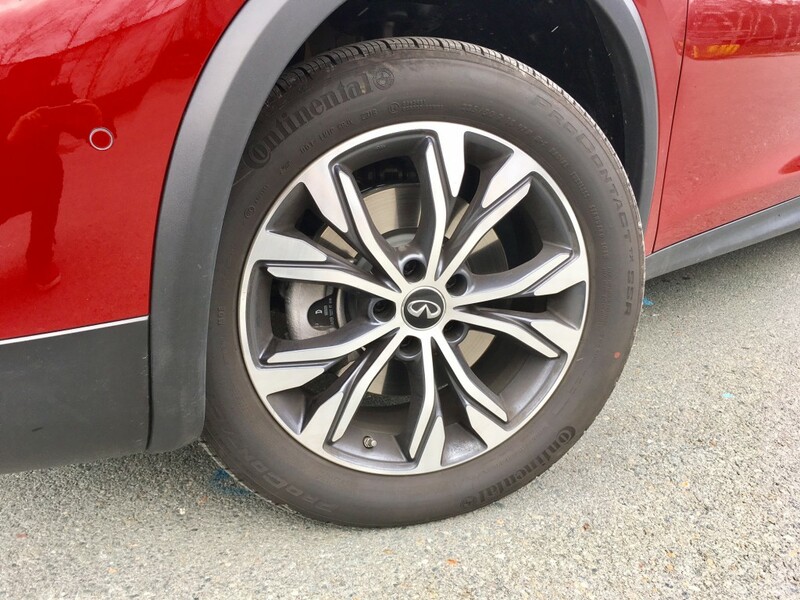 You see the Infiniti QX30 is part Japanese part German. It shares many components with the Mercedes-Benz GLA. It is, depending on which trim level you choose, either a compact SUV/CUV or premium hatchback. And already, I’ve read that the little identity-crisis-inflicted car is getting flack from its critics. I understand what that feels like. Though I’m not evaluating the Infiniti’s right to be here, I’m evaluating its worth as a winner of your hard earned cash. Unlike myself, my tester’s mixed roots can’t immediately be identified by its exterior. This thing has Infiniti styling in my through and through. That means swoopy and curvaceous lines galore – no stiff and conservative styling. 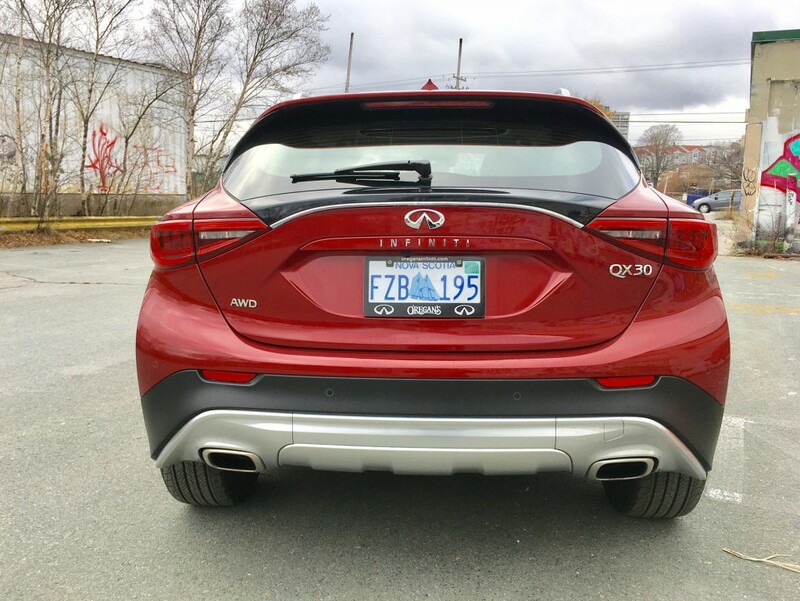 It works, for the most part, as I would frequently come back to a critic eye moving up and down the QX30’s body after returning from a shopping trip. With so little sheet metal space to work with, it can be difficult to make something this small look so attractive, but this iteration seems to work well. It’s definitely less awkward looking than Mercedes-Benz’s version and it conveys just the right amount of panache and sportiness. As much as it tries though, it just does not look like an SUV. So if that’s the look you’re going for Audi and BMW have offerings more suited to your taste. 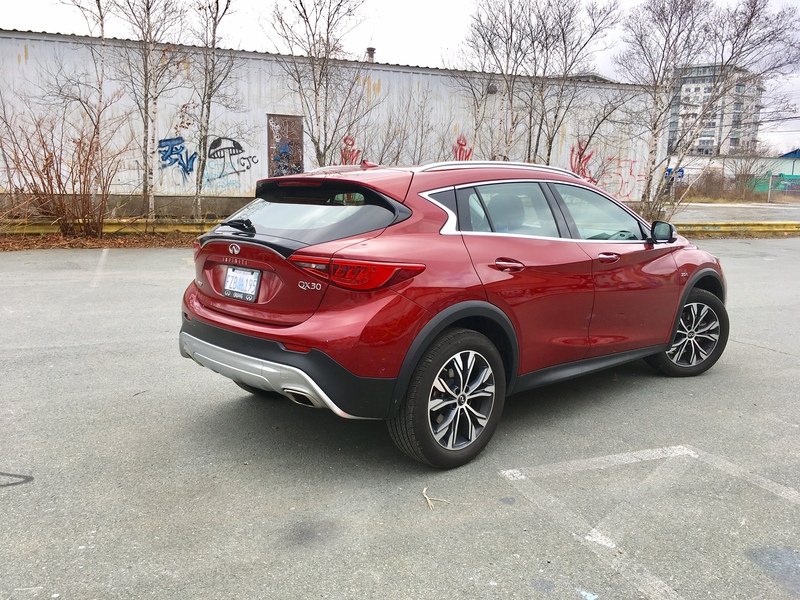 But the raised wagon/hatchback look seems to strike a cord with most Canadians, so I definitely don’t see styling playing any sort of downside for the QX30. Inside is where the QX30’s German roots become more obvious. From the front seat adjustment controls, to the steering wheel, to thee drive mode button, to the key fob, this thing screams German all the way. 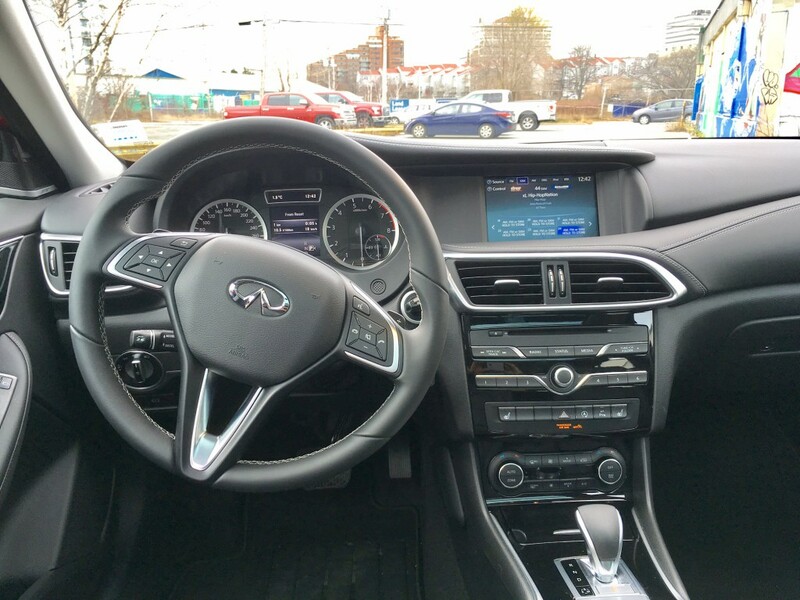 Crossing in some Infiniti bloodline brings an agreeable sense of premium and style inside. 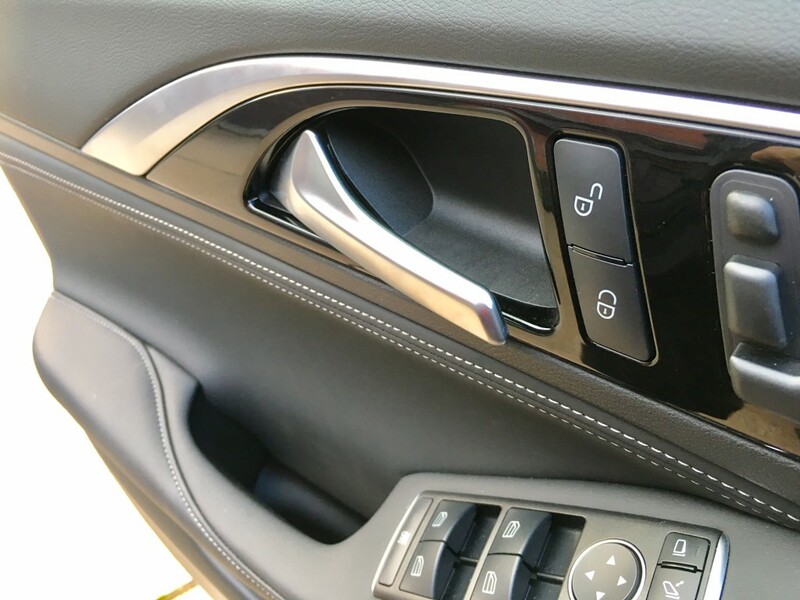 My only real gripes are that the shifter, while uniquely shaped and nice feeling in hand, is placed a little too low (as opposed to the column mounted shifter in the GLA) and the screen seems entirely too small for the space allotted for it. Otherwise, most should be pleased with quality and ergonomics. 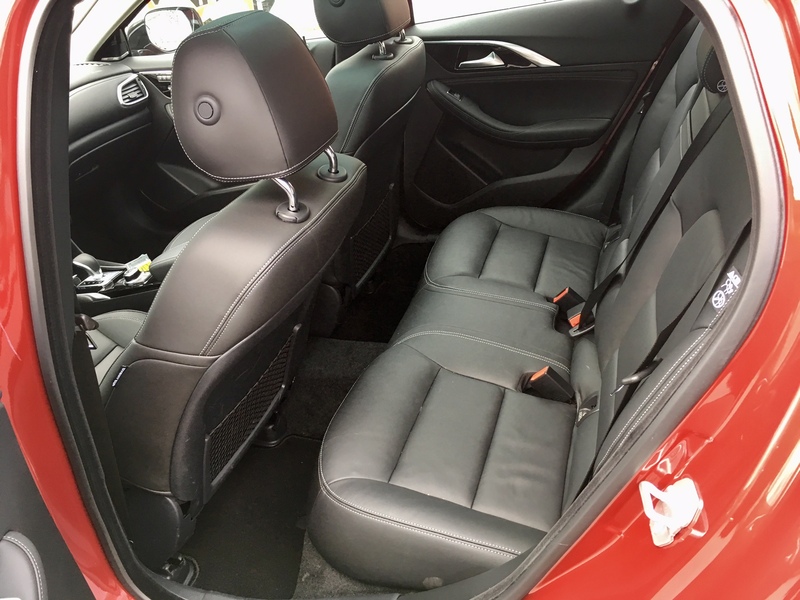 Comfort, on the other hand, may be a bit challenging given the QX30’s tight quarters. This is far from a QX80 and it feels like. Headroom, knee room and shoulder room all take a hit for rear seat passengers, and rear cargo room is about what you’d expect from a Yaris. There’s no power liftgate option to boot either and my tester was pretty well fully loaded. Still, the hatch design does offer a measure of versatility and I wasn’t wishing for more space up in the bucket seats. It would be safe to call this more of a two plus two where the latter are children or people you strongly dislike. I should also note that I had issue with the driver’s side interior door release handle sticking (pic above). It would seem to get stuck in this position and stay there until you forced it back into place. Not something you’d expect on a vehicle of this price. 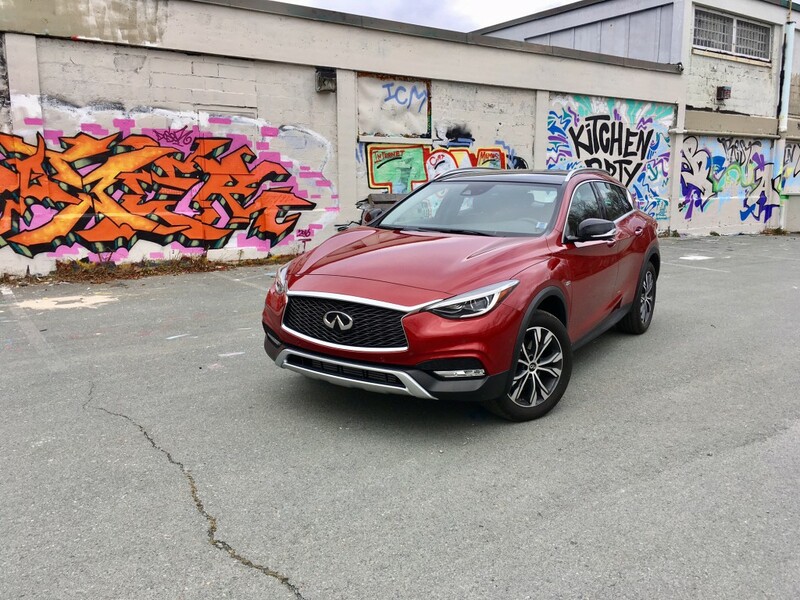 Unlike the GLA, the QX30 is only available with one engine option and it’s the 2.0 litre turbocharged 4 cylinder from Mercedes which nets 208 horsepower and 258 pound feet of torque mated to a seven-speed automatic. This is a good engine, though the transmission defaults to eco mode purely because there is no normal drive mode. There’s manual and sport modes but you need to select them every time you turn the vehicle on. That said, even in eco mode, power is adequate for most and the gear shifts are fairly crisp and predictable. This thing feels and drives like a German vehicle and that isn’t a bad thing in the slightest. It feels solid, composed and surefooted in the bends, despite the raised ride height. If you’re looking for a track star, the AWD is it, but the Sport version with the tuned suspension and lower ride height gets you a bit closer to the sensation, even if, in reality you would be well off the mark. 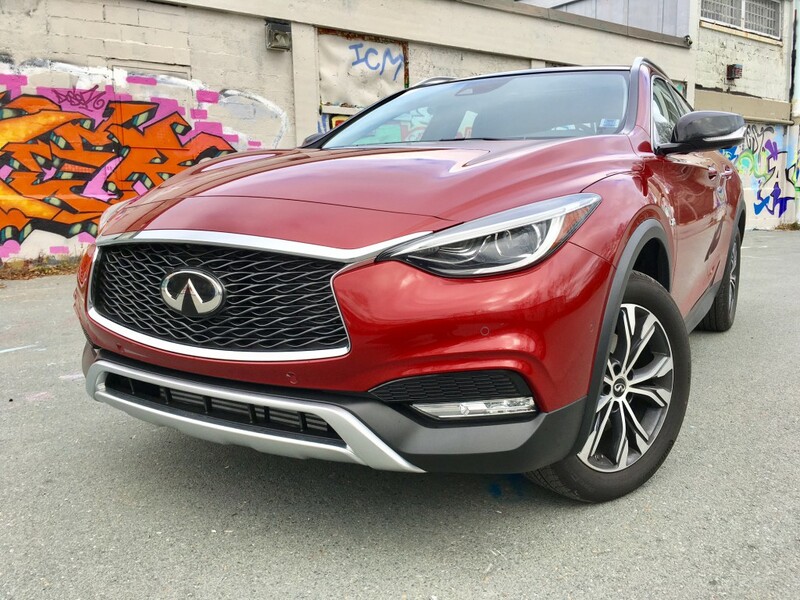 The QX30 is meant to handle bends in a composed fashion, giving confidence to the driver – not necessarily to be a rival to a BMW M3. Steering feels fairly direct and firm, though more relaxed at slower speeds. 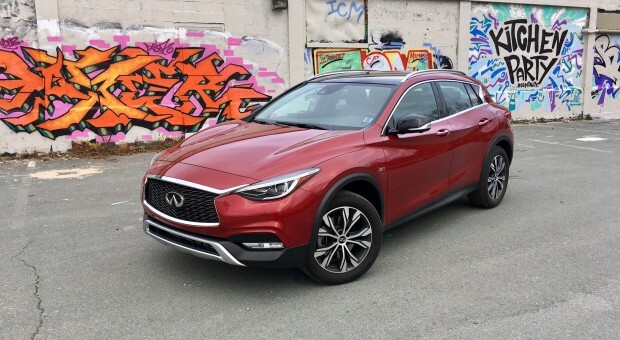 On the highway, the QX30 feels just as composed with plenty of driver assist aids to keep you out of the ditch or into another vehicle. Comfort isn’t exactly its forte. While the ride is far from jarring, it doesn’t convey a luxurious ride worthy of a premium name plate from Infiniti or Mercedes-Benz. That said, given the raised ride height, I still had confidence doing over bumps and imperfections in the road. We did get some snow during my time with the baby Infiniti. Unfortunately, this occurred while it wasn’t fitted with winter tires. Fortunately, it almost seemed as if it didn’t need them (not that I would ever recommend going without winter tires). But still, in about 15 cms of snow, not once did I feel as I was, or was about to lose traction. Ironically, the winter tires were fitted to it the next day, and while most of the snow was cleared by then, I still took it out to an unplowed lot to see just how much better it would fare with winter tires and I was not disappointed. Chalk this up as a reason to spend the extra cash for the all-wheel drive and raised ride height. Being a small vehicle with a small engine that automatically defaults to eco mode; you’d assume that this thing would be quite miserly. Well, not so much. In mixed driving I averaged 10.4 L/100 kms. That isn’t horrible but again, given everything I just mentioned, I was expecting a bit better. However, it should be noted that my time with the QX30 was during a cold snap which does affect fuel consumption of any vehicle. 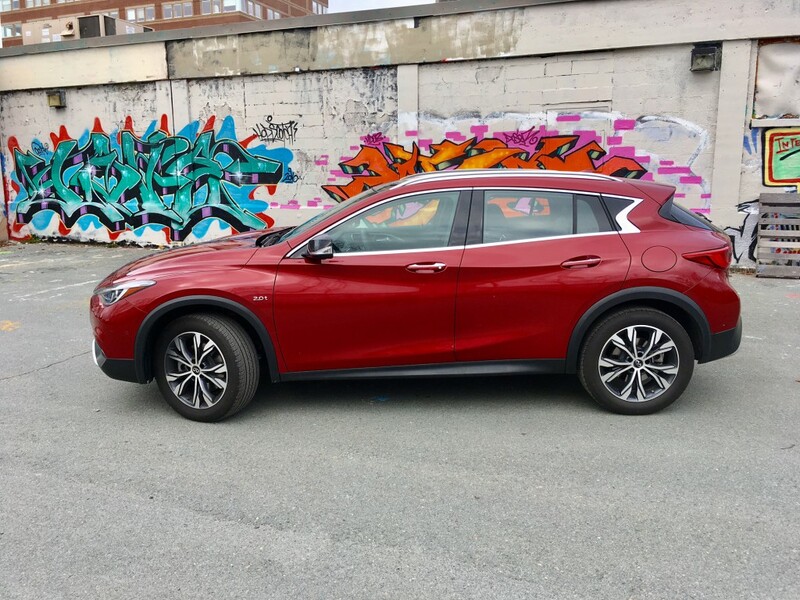 Despite literally not getting a lot of car for the money, the QX30 still makes a strong case for itself in the ever growing compact SUV/SUV segment. This is a good introductory vehicle to those new to the brand. Except it isn’t, though, is it? This feel more German than it does Japanese and thus, isn’t really a great representation of a typical Infiniti. But that doesn’t really matter. 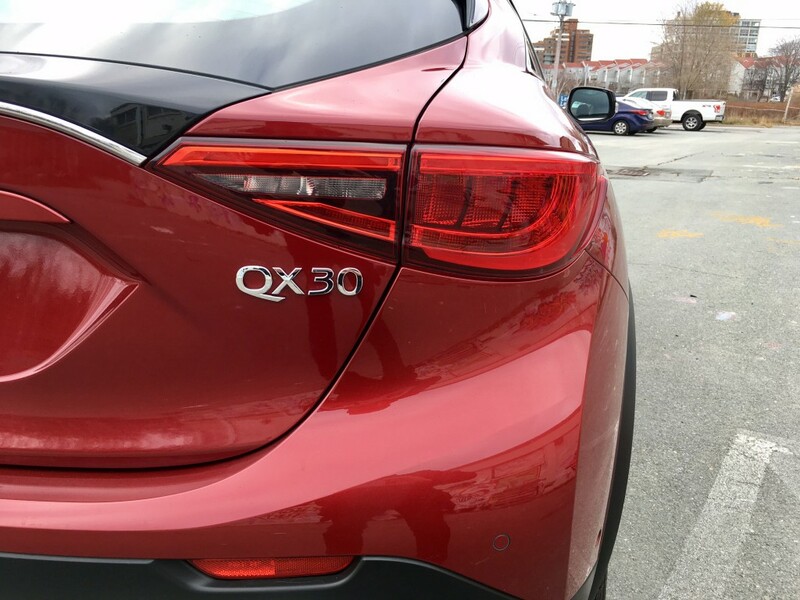 The QX30’s Japanese roots are evident where they count. And that takes me back to my original point. This sort of fusion works. In fact, were I looking for a vehicle in this segment, I would take the QX30 over the GLA. Not only do you get more value in terms of features for less, but it looks way better and still drives like a Benz. Like me and my fellow bi-racial human beings, you get the best of both worlds. Why is there no ‘normal’ drive mode?